Need to do Christmas on a budget? Want to give a clutter-free gift to people on your list? Last Christmas I really wanted to give practical gifts to some of our family members and I needed to do it on a limited budget. 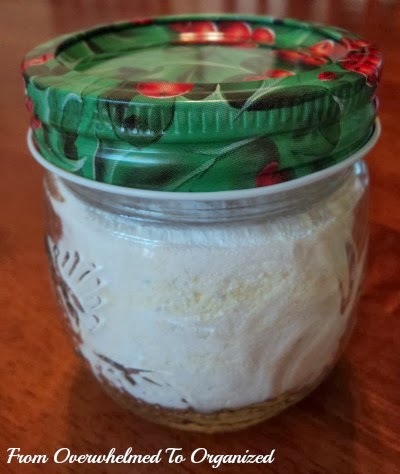 Since I started making homemade laundry detergent a few months earlier and I loved how it cleaned our clothes, I thought I'd make an extra batch at Christmas to give to some family members to try. They'd heard me talk about it already, but they weren't sure if they'd like it enough to make it. So it was a win-win all around! 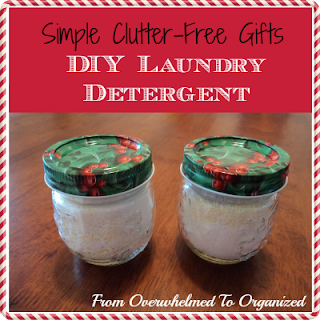 They got the opportunity to try out DIY laundry detergent and I got to give practical, clutter-free, budget-friendly gifts. I just used a hand grater this time, but I've also used a food processor for a larger batch. I mixed all the ingredients together in a large measuring cup. Here's a close-up of what it looks like. 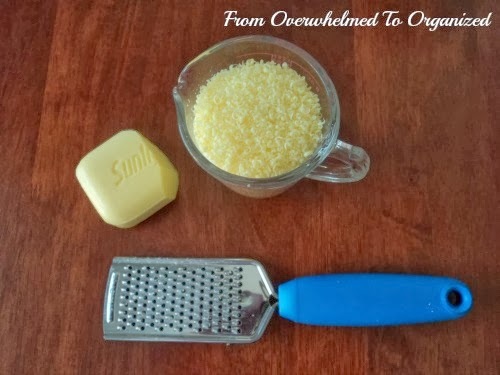 The little bits of grated lemon soap look pretty don't they? I keep our DIY laundry detergent in a big jar on top of my dryer. I have a small scoop to make it easy to add it to the water in the washing machine. 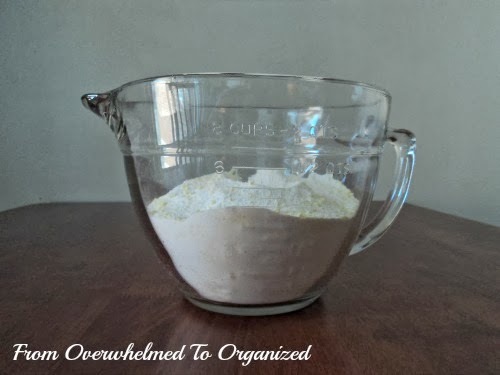 I just need to add about a tablespoon per load. It doesn't make suds the way other detergents do but it works really well. I especially like that it's less harsh than the chemicals in regular detergents, and that it is better for the environment. It's also so much cheaper than store-bought soap! 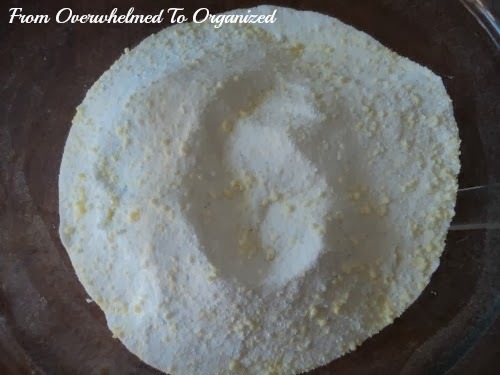 I made several batches of detergent out of the initial ingredients above and each batch lasted me months. And I've given it away several times since Christmas too. 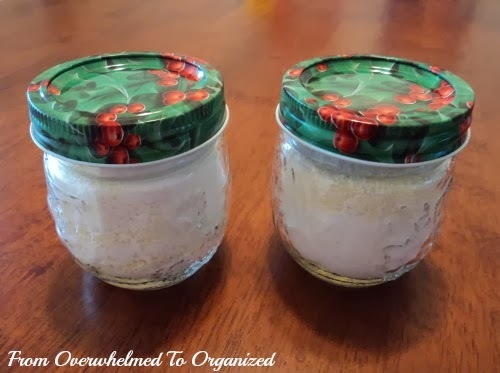 For Christmas last year, I gave small jars to several family members so they could give it a try. 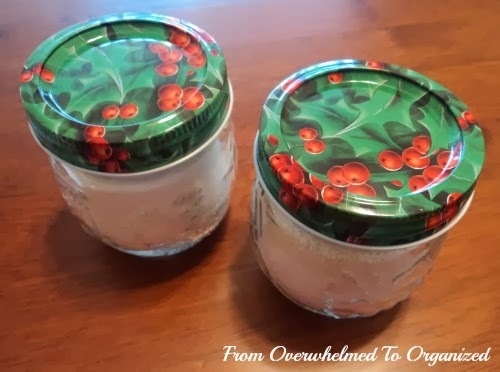 I used small sized mason jars and the Christmas lids I got for free on Freecycle. Aren't they cute?! The response was great from each of the recipients and some even started making their own laundry detergent afterwards! 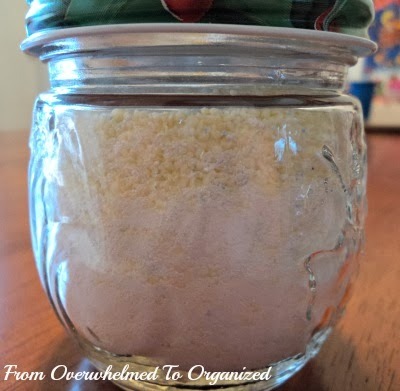 Do you make your own laundry detergent? What do you like about it? What simple gifts do you give? great job hilda......Do you think this detergent would work in a front loading washer? Or do you strictly have to add the soap to the water as it's filling in the machine (therefore only being good for top loaders)? I don't have a front loading washer so I can't speak from experience, but the blogs I read said they used it in front loading ones. You can add the soap at any time so that shouldn't be a problem. I'd be hesitant to use it on an HE (high-efficiency) machine - either top loader or front loader, as only HE detergent is to be used with them. I know someone who used regular detergent with one, and it ruined the machine - an expensive mistake. Thanks for the caution Allie! I don't have an HE machine and I'm definitely not an expert, but from the blogs I read people said it worked fine. The issue with HE washers is usually related to having too many suds, and since this detergent actually has less suds than regular detergent, that shouldn't be an issue. Definitely something to check into though if you have an HE washer because like you said they are costly! I think we all just grew up thinking more detergent and suds were what did the cleaning Helen. Suds seem to be the thing that are bad for HE machines. 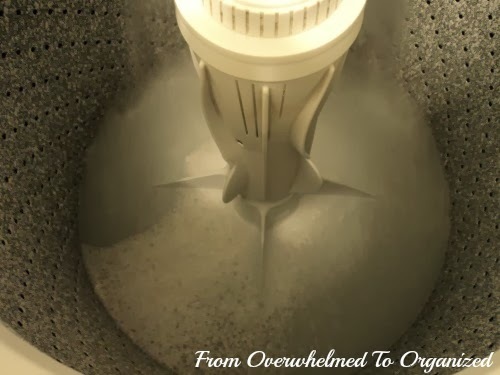 Once you've used up your stockpile of detergent you could try this (see comment above). I'm just confused as to where to add the detergent: in the drawer compartment or into the drum directly. Anyone with and HE washer used DIY detergent know? I just add mine in the drum, but I think with a front-loading machine you would add it to the compartment. There are also "recipes" online for liquid detergents, using similar ingredients. I've got some on my Cleaning board here: http://www.pinterest.com/organizerhilda/cleaning-cleaning-supplies/. 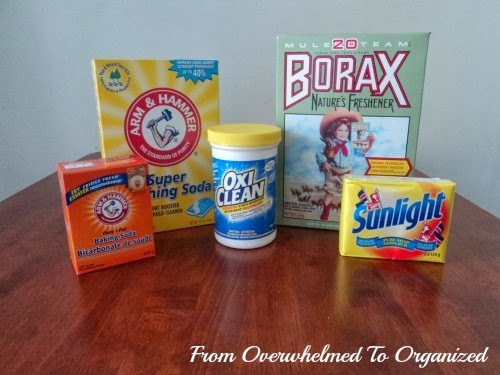 And here's a link about using DIY detergents in an HE washer: http://laundry.about.com/od/HomemadeLaundryProducts/f/Can-Homemade-Detergent-Be-Used-In-He-Washers.htm. Sorry I can't really speak from personal experience :) Anyone else? You're welcome Deonna! It started as a way to get other people to try it, but now I just like giving it away :) Thanks for hosting a great party!